One of the interesting ongoing protocols at the Massachusetts General Hospital Kidney Transplant Program is the combined kidney/bone marrow transplant protocol. The idea here is to transplant both kidney & hematopoeitic stem cells from the same donor, which will hopefully induce a state of immune tolerance that allows a sparing (and ideally a complete cessation) of immunosuppressive drugs without inducing rejection. The protocol would be most useful in younger patients who want their kidney transplants to last for as long as possible--with a goal of minimizing the use of calcineurin inhibitor therapy, which we know can lead to progressive allograft toxicity over the long-term. As described in this recent review by Megan Sykes, nonmyeloablative regimens are given--with the goal of not being so toxic as to result in marrow failure but sufficiently strong enough to overcome the potential reactivity of T-cells reactive to the HLA-mismatched donor stem cells. 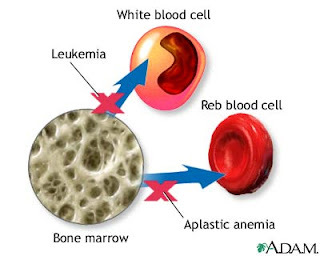 Apparently the key is to generate a state of mixed chimerism (some bone marrow cells from the recipient, some from the donor) to prevent rejection and avoid complications such as graft-versus-host disease. In the following 2008 NEJM article, five patients with ESRD underwent a combined kidney/bone marrow transplant. This pilot study has been declared a relative success given that four of the five patients have successfully been weaned off of immunosuppression, without rejection, over a follow-up period of between 3-6 years. Interestingly, some of the patients enrolled in this protocol develop a delayed graft function, with biopsies that look like rejection. Shouldn't these patients be LESS prone to rejection given that matched nature of the kidney & stem cells transplanted as well as the additional myeloablative therapy that is given beforehand? It turns out that the stem cell transplantation process is associated with a "cytokine storm"-type situation which may render the patient at high risk for allograft damage in the immediate post-setting. Fortunately, this appears to be a transient issue and most of the time the allograft function recovers nicely. Lithium, a very effective medication in the treatment of bipolar disorder, has a variety of well-documented renal side effects, including interstitial nephritis and nephrogenic diabetes insipidus. A less well-recognized complication is an increased prevalence of hyperparathyroidism in chronic lithium users. Individuals with chronic Li use frequently have both elevated calcium levels as well as elevated PTH levels, and it can be very difficult to differentiate from primary hyperparathyroidism or familial idiopathic hypercalciuria. The mechanisms for why patients on Li therapy have these lab abnormalities is still up for debate, but this interesting article describes three potential mechanisms: first, Li has been shown to block Ca2+ influx into a variety of cells by competitive inhibition of Ca2+ transport across the cell membrane. The elevated ionized Ca2+ would then drive up PTH levels. In addition, there is some evidence that Li raises the threshold of the Ca-sensing receptor in parathyroid cells, and increased Ca2+ levels are necessary to keep PTH secretion under check. Finally, it is postulated that Li directly increases PTH transcription by virtue of its inhibitory effects on the enzyme glycogen synthase kinase 3b (GSK-3b), a known transcriptional repressor of PTH mRNA. By the way, I learned today that Lithium is reabsorbed in the kidney via both the Na/H antiporter in the proximal tubule as well as ENac in the collecting duct. Therefore diuretics which block these transport mechanisms (e.g., amiloride) can have a dramatic lithium-lowering effect when acutely given to somebody on chronic Lithium. The water deprivation test is useful in the workup of patients with polyuria under certain situations. The differential diagnosis of polyuria often comes down to the following: does the patient have diabetes insipidus (either central or nephrogenic), psychogenic polydipsia, or an osmotic diuresis (e.g., due to hyperglycemia for instance). The first two conditions (DI or polydipsia) are all characterized by polyuria with a dilute urine osmolarity, but how to distinguish between them? If the serum sodium is high (D.I.) 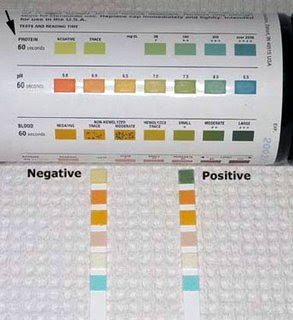 or low (polydipsia) the answer may be easily apparent, but in the instance where serum sodium is within the normal range the water deprivation test can provide an answer. (a) the urine osmolality reaches a normal value (e.g., above 600 mosm/kg, suggesting that both ADH secretion and response to ADH are intact). (c) the plasma osmolality is greater than 295-300 mosm/kg. In the situations of either (b) or (c), exogenous ADH is administered and the urine osmolality and volume are further monitored. In central D.I., exogenous ADH is predicted to lead to a rapid rise in urine osmolality: in complete D.I., the urine osm will more than double, while in partial central D.I. (which is more common) there will be an increase of at least 15% in the urine osm. Generally individuals with central D.I. are able to concentrate their urine osm > 300 mosm/kg. In nephrogenic D.I., there is either no response to ADH (complete nephrogenic D.I.) or a blunted response to ADH (up to 45%), though patients are rarely able to concentrate their urine osm above 300 mosm/kg. 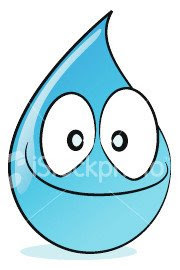 A more detailed protocol for the water deprivation test, approved by the Scientific Advisory Committee of the Diabetes Insipidus Foundation, Inc, can be found here. And for the really hard-core students of water metabolism, you can check out the following article I stumbled across on PubMed: The use of the water deprivation test for the diagnosis of apparent psychogenic polydipsia in a socially deprived African grey parrot (Psittacus erithacus erithacus), published in a 1988 issue of Avian Pathology. I was recently alerted to a great lecture series on acid-base & electrolytes by Mitch Halperin and colleagues which are published in the Quartery Journal of Medicine (QJM). They are generally case-based articles which use an imaginary physician and master physiologist, Dr. McCance, who examines the patient and renders a diagnosis. The articles are freely available, here are some links to a few of them. An integrative physiologic approach to polyuria and hyponatremia. An approach to the patient with severe hypokalaemia: the potassium quiz. Uncovering the basis of a severe degree of acidemia in a patient with diabetic ketoacidosis. The patient with a severe degree of metabolic acidosis: a deductive analysis. Unusual causes of hypokalemia and paralysis. Acute and fatal hyponatremia after resection of a craniopharyngioma: a preventable tragedy. An unusual cause for ketoacidosis. Anorexia nervosa and chronic renal insufficiency: a prescription for disaster. Osmotic demyelination syndrome: a potentially avoidable disaster. Severe hypokalaemia in a Chinese male. Acute hyponatraemia and 'ecstasy': insights from a quantitative and integrative analysis. Hyponatraemia and hyperglycaemia during laproscopic surgery. Severe degree of hyperglycaemia: insights from integrative physiology. A few basics about the prostaglandins, a major player in renal hemodynamics. 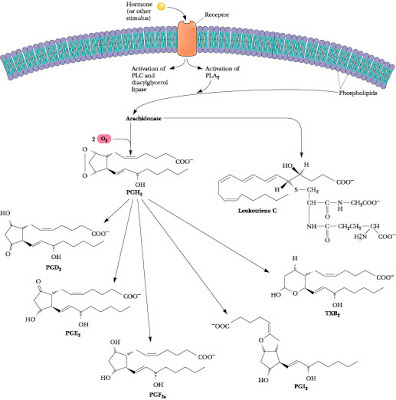 Prostaglandins are fatty acid-based compounds which carry out a variety of cellular effects. The pathway begins with phospholipid within the plasma membrane, which is converted to arachidonic acid by the enzyme phospholipase A2. Arachidonic acid then goes to one of two pathways: either it is metabolized by lipooxygenase to the leukotriene pathway (important for inflammation) OR it is metabolized by cyclo-oxygenase to the prostaglandin pathway. A variety of chemical modifications lead to different classes of prostaglandin: PGD's, PGE's, PGF's, PGI's, and thromboxane. There are many different classes of prostaglandin present in the kidney, but perhaps the most well-known is prostaglandin E2 (PGE2). PGE2 is at least in part responsible for the vasodilatation of the afferent arteriole which increases blood flow to the glomerulus; this phenomenon describes why NSAIDs (which inhibit prostaglandin synthesis) result in afferent arteriole vasoconstriction and why NSAIDs can cause a reduced GFR in patients who rely heavily on prostaglandin synthesis to maintain renal blood flow. PGE2 also is known to inhibit ADH-stimulated water permeability in the cortical collecting duct. There are two isoforms of the cyclo-oxygenase enzyme which converts arachidonic acid to prostaglandin H2: COX-1 (which is the constitutively active "house-keeping" gene present in most cells) and COX-2 (an inducible form of the enzyme which is generally active with inflammation). The COX-2 inhibitors (Vioxx, Celebrex, Bextra) were designed to exploit this, having a greater specificity for inflammation-associated increases in prostaglandins. Interestingly, however, the kidney constitutively expresses COX-2, and therefore COX-2 inhibitors can lead to alterations in renal hemodynamics similar to the NSAIDs. 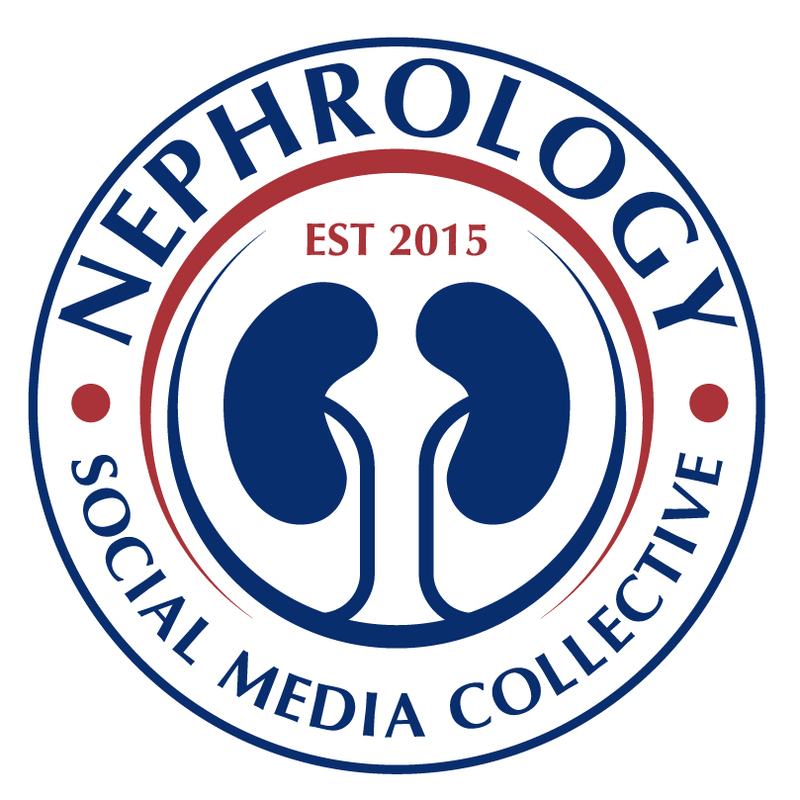 Today is the 1-year anniversary of the Renal Fellow Network. I started it towards the end of my 1st (clinical) year of nephrology fellowhip on April 23, 2008...and since this is the 320th post, I've done a reasonably good job at posting on a near-daily basis. Today's brief topic: the renal pharmacokinetics of phenytoin (Dilantin). Why this topic? It was the subject of a test question on the in-service exam and I realized I had never learned this before. This common antiepileptic drug, related to barbituates in chemical structure, is primarily metabolized in the liver. However, after the metabolites are secreted in the bile and reabsorbed in the gut, they are ultimately excreted in the urine. This occurs by two mechanisms, both via glomerular filtration, and to a large degree by tubular secretion. Based on metabolism by the p450 system, a number of drugs (common to ESRD patients) can dramatically influence phenytoin levels, which is important to monitor given the narrow therapeutic window of the drug. Phenytoin can be removed by dialysis in emergency situations (e.g., a massive overdose, for instance). Since phenytoin is removed by dialysis ESRD patients should be dosed following dialysis on these days. Some common drugs which increase phenytoin levels include amiodarone, salicylates, sulfonamides, and cimetidine. Others which decrease phenytoin levels include chronic alcohol use, sucralfate,and carbamazepine. In addition, oral calcium supplements should be staggered with Dilantin intake, otherwise there may be GI absorption problems of the medication. 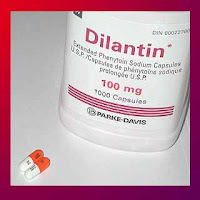 There is a recommended "renal dosing" of Dilantin but the formula given appears to include as variables a measured phenytoin level and also serum albumin concentration--there is no inclusion of creatinine. It is important to realize the difference between HYPOVOLEMIA and DEHYDRATION, two terms which are often used interchangeably but in fact reflect different things. Read the Up-To-Date entry « Dehydration is not synonymous with hypovolemia » by Burton Rose if there is any confusion about this. 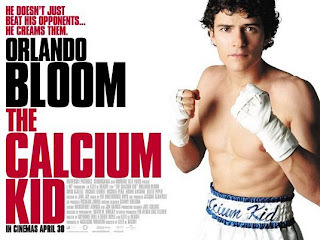 HYPOVOLEMIA refers to any condition in which the extracellular fluid volume is reduced, and results in decreased tissue perfusion. 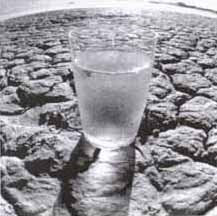 It can be produced by either salt and water loss (e.g. with vomiting, diarrhea, diuretics, or 3rd spacing) OR by water loss alone, which is termed DEHYDRATION. Salt + water loss comes primarily from the extracellular fluid whereas pure water loss (dehydration) come from the total body water, only about 1/3 of which is extracellular. 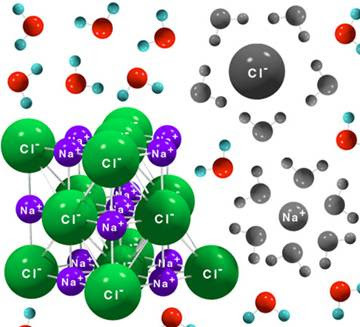 Thus for dehydration to produce the same degree of extracellular volume depletion as salt+water loss, 2.5 times as much fluid needs to be lost. Patients with DEHYDRATION are always hypernatremic. Trick question: where was the 9th Banff Conference on Allograft Pathology in 2007 held? 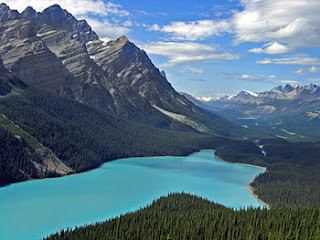 Hint: it wasn't Banff (the beautiful national park in western Canada). Answer: La Coruna, Spain. At this conference a consensus regarding the histopathologic classification of renal transplant biopsies was made and exists as an updated form of the so-called "Banff Criteria." It is currently the most widely-used scoring system for describing renal allograft biopsies. The full scoring system along with commentary can be found in this paper published in a 2008 issue of the American Journal of Transplantation. As I wanted to review this prior to taking my ASN in-service exam tomorrow, I'll write out the salient details of the Classification system. Class 1 is a "normal biopsy." Class 2 is "antibody-mediated changes." Ideally, both positive C4d staining and circulating donor-specific antibodies are present in the setting of a rising creatinine to make this diagnosis. In acute antibody-mediated rejection, there are three variants: (i) an ATN-like picture, (ii) capillary involvement, or (iii) arterial involvement. In chronic antibody-mediated rejection, there is evidence of chronic tissue injury such as glomerular double contours, peritubular capillary basement membrane multilayering, interstitial fibrosis/tubular atrophy (IFTA), or fibrous intimal thickening in arteries. Class 3 refers to "Borderline Changes" which is essentially a mild form of T-cell-mediated rejection. This category is used when there is no intimal arteritis present, but there are foci of tubulitis or minor interstitial infiltration. Class IA: there is at least 25% of parenchymal showing interestitial infiltration and foci of moderate tubulitis (defined as a certain number of immune cells present in tubular cross-sections). Class IB: just like Class IA except there is more severe tubulitis. Class IIA: there is mild-to-moderate intimal arteritis. Class IIB: there is severe intimal arteritis comprising at least 25% of the lumenal area. Class III: there is transmural (e.g. the full vessel wall thickness) arteritis. Class 5 refers to interstitial fibrosis and tubular atrophy (IFTA), which is the new preferred term for "chronic allograft nephropathy." Grade I refers to <25%>50% of cortical area involved. Class 6 is a catch-all term describing changes not considered to be due to rejection--for example, recurrent FSGS or CNI toxicity. One logical way to classify the different etiologies of hypocalcemia is to break them down into LOW PTH STATES and HIGH PTH STATES. Today I'll review the HYPOCALCEMIA WITH LOW PH STATES, or in other words, the causes of hypoparathyroidism. The most common cause of hypoparathyroidism is surgical hypoparathyroidism. This occurs in the setting of surgery of the thyroid gland, parathyroid glands, or other neck surgeries. In patients who have undergone a parathyroidectomy for HYPERparathyroidism, the sudden loss of PTH can lead to "the hungry bone syndrome"--a condition which is explained by the rapid absorption of calcium by bone once the PTH stimulus causing calcium efflux from bone has been removed. Fortunately most cases of surgical hypoparathyroidism are transient. The most common cause of hypoparathyroidism other than surgical causes is autoimmune-mediated hypoparathyroidism. This can be caused either due to immune-mediated destruction of the parathyroid glands or due to activating antibodies against the calcium-sensing receptor on parathyroid chief cells. 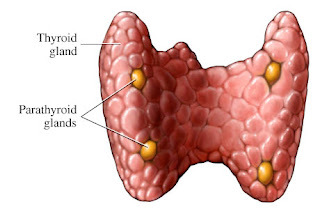 Autoimmune hypoparathyroidism may be an isolated disorder or may be part of a larger autoimmune dysfunction termed polyglandular autoimmune syndrome type I, in which hypoparathyroidism occurs in conjunction with chronic mucocutaneous candidiasis and adrenal insufficiency. Abnormal parathyroid development--which can be seen in complex syndromes such as DiGeorge's synrome--can also logically result in low circulating PTH levels. More rare causes of hypoparathyroidism include radiation-induced hypoparathyroidism and infiltrative diseases of the hypoparathyroid glands (e.g., Wilson's disease, sarcoidosis, hemochromatosis, or metastatic cancers). Finally, there are various genetic mutations that can result in hypocalcemia, which are most relevant to pediatric nephrologists. For example, autosomal dominant hypoparathyroidism is caused by gain-of-function mutations in the calcium-sensing receptor gene: you can think of this as akin to being on sensipar all the time. I remember learning about Lesch-Nyhan and thinking it was fascinating early on during a college course on neurology & behavior: affected children with this X-linked disorder develop the bizarre but highly characteristic behavior of self-mutilation, intentional biting of the tongue and lips for instance. The neurologic basis for these behavioral changes is not entirely understood, but the underlying basis for the disorder has to do with uric acid metabolism: the affected gene in Lesch-Nyhan syndrome is the hypoxanthine-guanine phosphoribosyltransferase (HGPRT) gene, which is necessary for the salvage pathway of purine synthesis for DNA. The absence of HGPRT results in elevated levels of uric acid which result in uric acid nephrolithiasis, gout, and gouty nephropathy in addition to the disturbing CNS manifestations mentioned above. The gold standard for diagnosis is discovering low levels of HGPRT enzyme activity in cultured cells from the affected individual. A recent article in AJKD describes the use of Rasburicase to treat elevated uric acid levels in Lesch-Nyhan syndrome in an affected neonate. Rasburicase is an urate oxidase enzyme which rapidly reduces serum uric acid levels; it will be interesting to see if this reduction translates into an improvement in neurologic symptoms seen in this syndrome. Quick teaching point I picked up from the exam: reviewing the management of immunosuppressant drugs in the kidney transplant patient who is pregnant. CNI's (cyclosporine & tacrolimus) are okay, as are steroids and azathioprine. The two main drugs to watch out for are MMF (Cell Cept), which is a known teratogen in animal studies, and sirolimus (rapamycin) which is a suspected teratogen. Kidney transplant patients who are on either Cell Cept or rapamycin should have these agents switched to a safer immunosuppressant (e.g., azathioprine) if they are considering pregnancy. Patients with ADPKD are predisposed to nephrolithiasis. The postulated reasons for this increased prevalence of stone disease have ranged from metabolic abnormalities (previous reports have shown an increased tendency for hyperoxaluria, hypercalciuria, hypocitraturia, hyperuricosuria, and distal RTA) to anatomic abnormalities (large, obstructing cysts and dilated tubular lumens may create a situation of tubular stasis, which predisposes to stone formation). 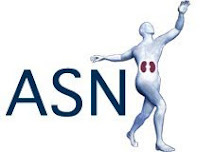 A recent paper in C-JASN seeks to address the risk factors for nephrolithiasis in ADPKD patients. The researchers looked at a total of 125 patients with ADPKD and had them undergo both CT scan and Renal Ultrasound, as well as 24-hour urine analysis, looking for evidence of nephrolithiasis. About 25% of patients had evidence of stone disease on CT scan (which was significantly more sensitive than Renal Ultrasound). Although the researchers found a high prevalence of metabolic abnormalities in ADPKD patients (especially hypocitraturia) there were no excessively increased risk of stone formation in the presence of such metabolic abnormalities. In contrast, anatomical abnormalities DID seem to predict an increased risk of nephrolithiasis: those with a renal volume >500ml had an increased risk of stone disease. Plasma oncotic pressure is important to prevent edema, right? And you would think that albumin, which plays a critical role in the binding of multiple plasma proteins and ionized calcium, is essential to life, right? The rare, autosomal recessive disorder congenital analbuminemia would seem to suggest otherwise. Although it is extremely rare (estimated at less than one in a million), it is able to teach us important physiologic lessons. 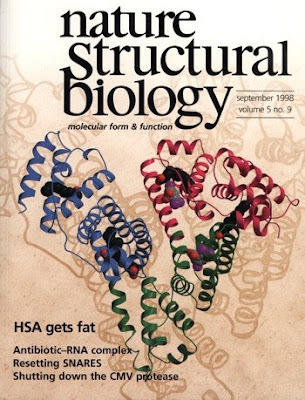 The disease is caused by mutations in the human serum albumin (HSA) gene which result in a markedly decreased serum albumin concentration (estimated at between 1/100th to 1/1000th of the normal serum albumin concentration), individuals with the disorder generally do well, usually with only mild edema that may even go unrecognized in childhood. Individuals do not have proteinuria but often have hyperlipidemia. It is postulated that oncotic pressure is maintained in part by an increased hepatic synthesis of other plasma proteins to compensate. The generally mild phenotype is fairly surprising in my opinion because of the many physiologic roles ascribed to albumin in biology. It also hints that perhaps something other than the hypoalbuminemia and subsequent loss of oncotic pressure observed in patients with nephrotic syndrome is responsible for their edema. The three letter acronym EMT: what should it mean to nephrologists? Not just "emergency medical technician"...but also "epithelial-to-mesenchymal transition." As we all know the nephron is comprised of a long tube of highly-differentiated epithelial cells. 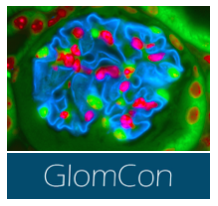 These cells have clearly defined apical and basolateral membranes, tight junctions, and cilia. Under normal conditions, these cells should remain epithelial cells for the duration of their lifespan. 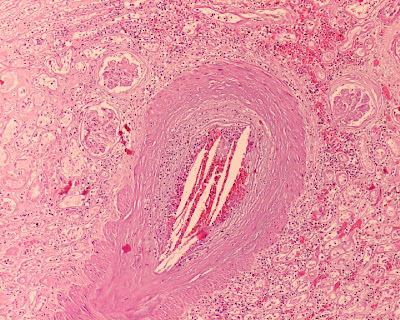 However, under various pathologic conditions they may become mesenchymal cells, which are less differentiated, lack such an obvious apical-basolateral polarity, and have an absence of tight junctions. One current hypothesis is that the renal parenchymal fibrosis that characterizes CKD is due to a TGF-beta-mediated epithelial-to-mesenchymal transition of tubular cells, turning them into more of a fibroblast-like cell type which secretes extracellular matrix. The same type of cellular re-programming is seen in cancers which derive from well-differentiated epithelium (e.g., colon cancer, breast cancer) but develop into metastatic, poorly-differentiated cells. During development, the EMT process essentially works in reverse: you start with mesenchymal cells, and via cross-talk between the metanephric mesenchyme and the ureteric bud there is a gradual commitment of cells to an epithelial morphology. It's important to teach your kids the important stuff in life...like, for instance, the fact that the kidneys are located in a retroperitoneal location, as demonstrated by my daughter. I recently had to look up the differential diagnosis of nodular glomerulosclerosis: we had recently sent a clinic patient to undergo a renal biopsy based on a history of nephrotic-range proteinuria (urine protein to creatinine ratio of about 4) and a gradually rising serum creatinine last measured at 1.7 mg/dL. 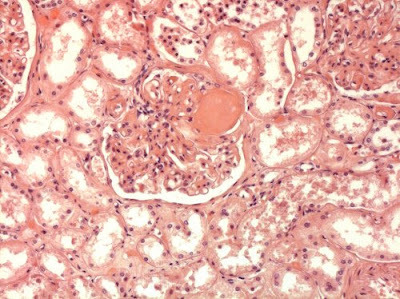 The pathologist was eager to ascribe a diagnosis of diabetic nephropathy upon describing nodular glomerulosclerosis in the biopsy specimen; however, there was one big problem with this diagnosis: the patient did not have diabetes! So: what else causes nodular glomerulosclerosis besides diabetic nephropathy? Chronic MPGN is part of the differential diagnosis, as are dysproteinemias such as amyloidosis or monoclonal Ig deposition disease. Organized glomerular deposition diseases such as immunotactoid GN, fibrillary GN, or fibronectin glomerulopathy can also result in nodular glomerulosclerosis. Chronic hypoxic or ischemic conditions--as might be found in individuals with congenital cyanotic heart disease or cystic fibrosis, for instance--can also result in nodular glomerulosclerosis. The diagnosis we are entertaining in our patient is an entity termed "idiopathic nodular glomerulosclerosis" (ING), which appears to be associated with a long-standing history of smoking and hypertension. There are several case series of ING which describe biopsy findings as would be expected in diabetic nephropathy in non-diabetic patients, including this review by members of the Pathology Dept of Columbia University. I heard a lecture not too long ago on atheroembolic renal disease which claimed that atheroembolic renal disease is to nephrology as sarcoidosis is to internal medicine. 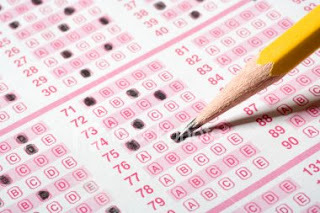 That is to say, it can present in a myriad of fashions, ends up being the diagnosis in a surprising number of complex cases, and pops up an inordinate number of times on tests. Although spontaneous atheroembolic can occur, much more commonly it is the result of iatrogenesis, with cardiac catheterization being probably the most common offender. Mechanical disruption of atherosclerotic plaques results in a showering of cholesterol emboli to downstream organs, where they are likely to lodge in small arterioles. The crystals induce an inflammatory reaction, resulting in adventitial fibrosis that eventually obliterates the vessel lumen. 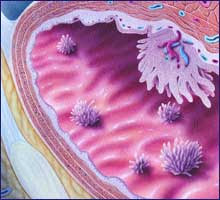 The crystals of cholesterol are dissolved during fixation, leaving biconvex "ghosts" within the affected arterioles, as demonstrated on this biopsy section. Other physical & laboratory findings that can tip you off to a diagnosis of atheroembolic disease include livedo reticularis, amaurosis fugax, bluish discoloration of the distal extremities (often in an asymmetric pattern), peripheral and/or urine eosinophilia, and an elevated ESR/CRP. 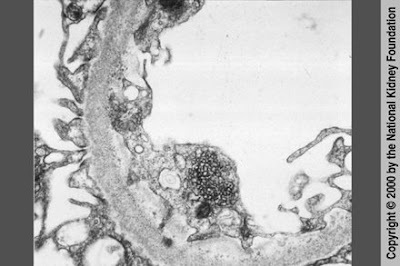 The histology of HIVAN (HIV-Associated Nephropathy), at the light microscopy level, is indistinguishable from that of collapsing FSGS: the glomerular capillary loops are collapsed. Furthermore, both entities demonstrate foot process effacement (as in all forms of nephrotic syndrome) on electron microscopy. 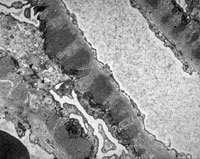 However, one distinguishing feature between HIVAN and collapsing FSGS is the presence of tubular reticular inclusions (see photo) within endothelial cells commonly seen in HIVAN, but not collapsing FSGS. This finding is not 100% sensitive for HIVAN, nor is it 100% specific: the current thought is that these inclusions form in response to high circulating interferon-alpha levels, which may also be present in inflammatory conditions such as lupus. Mycophenolic acid is a commonly encountered medication in nephrology. In addition to its use in the vast majority of kidney transplant recipients as part of the immunosuppressive regimen, it is also gaining popularity in the treatment of immune-mediated diseases such as lupus nephritis and ANCA-associated vasculitis. The drug is usually compared to azathioprine since they both function as antimetabolites, inhibiting purine synthesis in rapidly-dividing cells. However, mycophenolate is more lymphocyte-specific, inhibiting inosine monophosphate dehydrogenase, which controls the rate of synthesis of guanine monophosphate in the de novo pathway of purine synthesis in lymphocytes, and therefore is associated with fewer side effects than azathioprine. It is available as mycophenolate mofetil (Cell Cept, used most commonly) or mycophenolate sodium (Myfortic). Side effects of MMF: the two main ones are (a) an increased susceptibility to infection--much like all immunosuppressant drugs, and (b) frequent GI side effects such as nausea, vomiting, and diarrhea. There are several options for patients who have intolerable GI side effects: the dose could be lowered or stopped altogether in favor of a different drug such as azathioprine; sometimes spacing out MMF to three or four times a day (instead of the traditional bid dosing) may help, and finally the sodium salt (Myfortic) is allegedly associated with less GI side effects. Finally, MMF is listed as a "Group D" drug (known to be unsafe in pregnancy), so fertile women who get it should be placed on some type of birth control. Clinical trials evaluating the efficacy of various therapies of membranous nephropathy is a tricky business, given the natural history of the disease: because about 1/3 of patients spontaneously remit, it is often difficult to say that a patient's positive response was indeed due to the intervention being tested, and large numbers of patients (something often difficult to find) are difficult to find. In general, the current approach is generally to try a 6-month period of "conservative therapy" characterized by RAAS blockade with ACE-Is and/or ARBs. If patients do not achieve a remission, a trial of immunomodulatory therapy--typically steroids/Cytoxan or steroids/CNIs--is attempted. Given the multiple side effects and only partial efficacy of the above regimens, other alternatives are sorely needed. One such alternative is rituximab (Rituxan), a monoclonal antibody against the B-cell antigen CD20. A recent review in C-JASN by Bomback et al describes the current literature for the use of Rituxan in the treatment of membranous nephropathy. Taken together, all the data describes in total 85 patients--with most patients coming from either a group at the Mayo Clinic (Dr. Fervenza) or Italy (Dr. Remuzzi)--which admittedly is not enough to come to any firm conclusions about the use of Rituxan in MN. The response rates for Rituxan in these trials was similar to those for Cytoxan and CNIs--about 15-20% for a complete remission (CR) and about 35-40% for a partial remission--which may be quite good considering that many patients in these trials had already "failed" Cytoxan or CNIs prior to enrollment. However, the authors conclude that there is insufficient evidence to use Rituxan as a first-line agent for the treatment of MN and that a randomized controlled trial will be necessary to address this possibility. This is an interesting figure, taken from the 2008 USRDS (United States Renal Disease System) Atlas, which illustrates where patients in the U.S. are getting their dialysis from these days. Nearly 63% of all patients are getting dialysis from one of the four LDO's ("large dialysis organizations"), the two largest of which by far are DaVita (94,000 patients) and Fresenius (84,000 patients) which for now are dominating the market. These numbers are actually from 2006 and do not reflect the fact that Fresenius has recently purchased the 3rd place company on the chart, "RCG" (Renal Care Group) and DaVita has recently purchased Gambro Dialysis centers. Less than 7% of patients get their dialysis from SDO's ("small dialysis organizations"), a number which continues to decrease as a result of consolidation of dialysis power into the LDOs. The non-profit Dialysis Center, Inc. (DCI) accounts for about 13% of dialysis in the U.S. The remainder of patients are dialyzed by independent or hospital-based dialysis centers. How much Cytoxan is too much? Cytoxan is a very potent but also potentially toxic medication used for a variety of immune-mediated (and nephrology-relevant) diseases. It is often classified as a "cytotoxic agent", as it works as an alkylating agent that explains its utility also as a chemotherapeutic agent. Because it is traditionally used at very high doses in oncology as compared with nephrology, the risk of side effects is dramatically increased in oncology patients. However, the risk of malignancy--most notably bladder cancer, but also leukemias and non-melanoma skin cancers--is still present in nephrology patients treated for conditions such as lupus nephritis or ANCA-associated vasculitis. How can you minimize this risk? A 2008 study by Faurschou et al looked at a cohort of 293 patients diagnosed with Wegener's granulomatosis, many of which were treated with cyclophosphamide. They found that the risk of bladder cancer or leukemias was elevated for those explosed to a cumulative dose greater than 36 grams, but there was no increased risk of either cancer for those with a cumulative dose less than 36 grams. A cumulative dose of 36 grams would correspond to taking Cytoxan 100mg a day for 1 year. The authors also report that patients developed bladder cancer between 6.9 - 18.5 years after cyclophosphamide exposure. One strategy for giving Cytoxan in Wegener's that I have seen used quite often is giving Cytoxan and prednisone when the disease is initially diagnosed for a period of 6 months--then transitioning to, say, steroids and azathioprine. This way, the Cytoxan can be used to get the disease under relative control without causing the dramatically increased risk in cancers, and still could be used a 2nd time if there is another serious flare in the future. Also, because the appearance of cancer is relatively delayed, one may be less hesitant to use Cytoxan for longer periods of time in the elderly. HMG coA-reductase inhibitors (a.k.a. 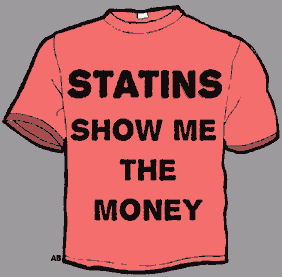 "statins") are one of the most successful drugs in recent history...one does not have to look far to find good, solid randomized, controlled trials touting the benefits of statin therapy in any number of patient populations. Interestingly, there is one patient population where the beneficial effect of statins does not seem to be so impressive: ESRD patients. This was most notably demonstrated in the 2005 "4D" Study which I have mentioned in a previous post; and now in this week's New England Journal of Medicine there is another randomized control trial by Fellstrom et al demonstrating a lack of benefit of statins in dialysis patients. Briefly, over 2500 ESRD patients were randomly assigned to either placebo or 10mg of rosuvastatin. The primary outcome was a composite end-point of either MI, stroke, or cardiovascular death. Despite having 43% lower cholesterol levels than the control group, the rosuvastatin group showed no improvement in cardiovascular events, once again arguing against a role for routine statin therapy in ESRD patients. Interestingly, even with subgroup analysis looking at ESRD patients with known cardiovascular disease there was no benefit of statin therapy seen. All this points to the growing suspicion that cardiovascular disease in CKD/ESRD patients may occur via a different mechanism than garden-variety atherosclerosis. There is some data to suggest that while atherosclerosis is a disease of the intima, the cardiovascular disease of CKD/ESRD occurs at the level of medial calcification. In addition, this study further implies that the beneficial effect of statins seen in the general population may occur independently of its cholesterol-lowering effect. For a more in-depth analysis of this paper & its framework within the treatment of cardiovascular disease in ESRD patients, see this post on Precious Bodily Fluids. Albuminuria Screening for the General Population? An article by van de Velde et al in this month's JASN describes the results of the Prevention of Renal and Vascular End-stage Disease (PREVEND) study, a cohort study in which the ability to predict the need for renal replacement therapy based on albuminuria screening of the general population was performed. The study looked at over 40,000 individuals from the Netherlands over a wide range of ages, health and disease who had urine albumin measured. They found that a severely elevated urine albumin (>100 mg/L) is associated with a hazard ratio of 37 of needing RRT over a 10-year period, while a more modestly elevated urine albumin (between 20-100mg/L) is associated with a hazard ratio of 3 of needing RRT. While renal failure certainly occurred more commonly in those with standard risk factors (e.g., diabetes, vascular disease, early-onset hypertension), the authors demonstrate that between 40-50% of patients with albuminuria detected on screening did not have one of these risk factors. They conclude that aluminuria screening for the general population would be a good idea to identify those at risk for worsening renal function, particularly because a treatment known to slow the progression of proteinuric CKD (ACE-I/ARB therapy) is now readily available. In the same issue, there is also an accompanying editorial in which the author disagrees with the above conclusion, suggesting that screening the entire population for proteinuria would likely not be cost-effective and would only rarely prevent the need for RRT.